Former Grace Brethren pastor, Wendell Kent (pictured at right), is an author again. 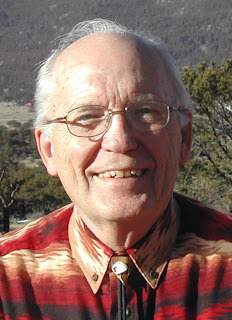 His third book, Head for the Hills, was recently reviewed in the Chaffee County Times, near where Wendell and his wife, Pat, live in Buena Vista, Co.
“It’s a short and entertaining set of essays about 14 people, plus four others whom Kent calls ‘The Big Four,'” wrote Times copy editor Theresa Williamson. Most of the names are familiar, and all of them were drawn to mountains, Kent says. Katharine Lee Bates, John Denver and Joseph Machebeuf are included. At the end of each profile, Kent tells his readers what the person ‘found’ after heading to the mountains. Lowell Thomas found fame, but Augusta Tabor found heartbreak. The Big Four? They’re the presidents immortalized on South Dakota’s Mount Rushmore. If those four heads could talk to each other, what would they say? Kent’s imagination provides the answer in his ‘The Big Four’ chapter of Head for the Hills. The book is available by writing Wendell at 16644 CR 369, Buena Vista, CO 81211. Blame it on the Altitude and Maybe it isn’t the Altitude are his previous books. The Kents have lived in Buena Vista for more than ten years. He is a frequent contributor to “Writers Corner” in the Times.